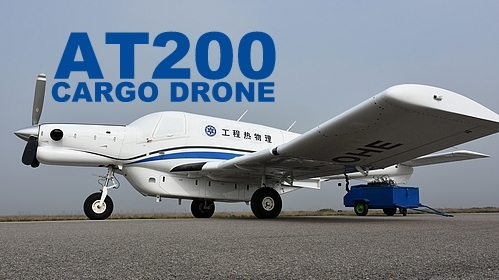 According to the latest media reports, China has begun production of its AT200 cargo drone (unmanned aerial vehicle - UAV) after the completion of successful airworthiness trials in 2018. It is based on P750XL turboprop light utility aircraft, which is designed and built by Pacific Aerospace, an aircraft manufacturing company based in New Zealand. On October 26, 2017, a prototype of AT200 successfully performed a pre-programmed flight between Pucheng Neifu Airport and Danfeng Airport in Shaanxi province. It flew altitudes of up to 16,732 ft (5,100 m) over the Qinling Mountains. The video released by its Chengdu-based manufacturer Star UAV System and its co-development partner Chinese Academy of Sciences (CAS) to China Central Television (CCTV) showed the aircraft taxiing, taking off and landing automatically. AT200 cargo drone measures 11.84 m-long and 4.04 m-high and has a wingspan of 12.8 m. It has cargo compartment of 10 cubic meters which can accommodate 1.5 tonnes of cargo flying at 6000 meters with a cruising speed of 313 km/h with a 2000 km+ range. When fully-loaded, it can take off and land on a 200 meters runway. It can operate in both autonomous and remote pilot modes. The drone is powered by 750hp PT6A-34 lightweight, twin-shaft, turboprop engine developed by Pratt and Whitney Canada. It drives a three-blade propeller, which is mounted in the front in tractor configuration. Currently, Star UAV System has a contract from SF Express - China's second largest domestic and international courier (based in the Guangdong province) - in October 2017, under which it will supply three AT200 air vehicles for further evaluation and operational testing. With SF Express, the company "will validate air traffic control, autonomous flight, and navigation technologies, and safety procedures that are necessary to enable large-scale unmanned air logistics operations within the country". Also, the company has signed a contract to deliver up to 50 AT200s to an undisclosed customer by the year 2022.